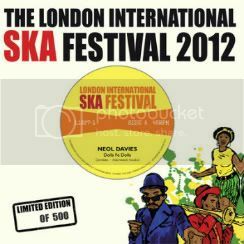 The rather lovely limited edition (2000 numbered copies) 2012 Ska Fest book is available now. 120 pages of features on the history & progression of ska, a photo review of 2011′s festival, Top 10s, an overview of this years fest, an 11 track free CD (ft. exlusive tracks from Phoenix City All-stars, The Dualers & Neol Davies, plus Los Granadians, Rebelation, Capone & The Bullets, Sidewalk Doctors, Hotknives) and much much more. Strictly ltd.to 2000 copies. Once they’re gone they are gone. These really are lovely collectors pieces! SATURDAY SKA JAM: acts tba! We are delighted to announce NEVILLE STAPLE from The Specials will now be headlining Day 4 of The London Intl Ska Festival (6 May) as part of a 2 Tone Double Bill. Best known as frontman/toaster of The Specials, Neville Staple initially joined 2 Tone’s finest as their roadie. At a fateful gig supporting The Clash, Neville took to the stage and never looked back. From the opening lines of The Specials debut single Gangsters… “Bernie Rhodes knows…Don’t argue” cemented the original rudeboy in popular British music forever. At the height of The Specials powers, with the iconic Ghost Town at number one on the British charts, Neville departed with Terry Hall and Lynval Golding, to form Fun Boy Three. Since those heady times he has never stopped performing and with The Specials incredibly successful reformation not looking to let up any time soon it’s testament to Neville’s work ethic that he still finds the time and energy to pursue his solo career. Neville replaces Fishbone, who sadly had to cancel their European tour due to singer Angello Moore knee surgery. The Fishbone London performance has been rescheduled to Nov’12. Big show coming up tonight from 10pm-12am on Montreal’s Roots Rock Rebel show! They’ve got an interview with reggae legend Dave Barker, plus a preview of The London International Ska Festival. Tune in at 90.3 FM in Montreal, or www.ckut.ca everywhere else! We are very disappointed to announce that Fishbone have cancelled their European tour, which included The London Intl Ska Festival. “Angelo Moore is at the hospital since last week end. His knee is seriously infected by a staphylococcus further to a surgical operation last year. The doctors are opposed to any travel. He has had 2 times surgery in the last 72 hours and will be under medical care/laid up for the next 6-12 weeks”. Naturally we are gutted that Fishbone won’t beable to make the ska festival and wish Angelo a speedy recovering. We hope to rescheulde their performance for a ska fest special later in the year. All tickets will remain valid for that. If you’re still heading to the festival we have already secured a superb replacement headline act, which we will announce next week… so watch this space! The rest of Day 4’s line up is still KILLER… Neol Davies aka The Selecter, The Skints, Chris Murray, Rebelation, Don Letts & Bazza Barrett (Pressure Drop).